Day 22: Swakopmund to Solitaire - We set out from the converted railway station of the Swakopmund Hotel and headed South. Firm salt roads take you out of town but you soon find yourself pounding down arrow-straight gravel roads once more. There is no such thing as rush hour in Namibia, and the route rapidly takes us out of town and once again head storming through stunning terrain. But no two days have ever been the same on this road-trip, and our early morning run saw the sea-mist that had rolled in from the Skelton Coast during the night lifting just in time to catch our first glimpse of the giant sand dunes on the edge of the Namibian Desert. Our route turned East then South, with a checkpoint at the cafe of Solitaire. The place is famous for the rusting car wrecks perched in the cactus outside the bakery. Morris Eight tourer, Ford Zephyr, Peugeot 404, and a Chevy Coupe are timeless relics here, slowly decaying into the sand, where nothing rots away quickly in this dry desert air. Everyone stops awhile, swaps stories, as time cards are stamped before heading on another 30 kms to our hotel, in a setting of simple low rise brick bungalows surrounded by palm trees. Our evening saw most take to a fleet of open jeeps for a sundowner out in the dunes, watching the sun set from a peak overlooking a terrific view of the plain stretching out to the far horizon and the setting sun. The gin and tonics flowed well. Trouble today? Three cars are in difficulty. The Haslam's Jaguar has lost top gear, but the crew seem perfectly optimistic that they will make it to Cape Town, the crew of car 11, the yellow Jeep of Ernie and Jeanne Gabiati, lost a front wheel when the front wishbone snapped, and the Crossley.... is sadly out of the event, after a determined effort. This time the clutch has disintegrated. The car is to be shipped home and The Long's are to continue with us all having now joined the Hertz Class. For the record, here are the results of yesterday's Medal Section: 1st, Dennis Varley, Ford Falcon; 2nd, Peter Lovett, Porsche 911, four seconds behind; 3rd, Mike McInerney, Ford Mustang, four seconds behind the Porsche; 4th Jose de Sousa, Volvo, three seconds behind the Mustang. 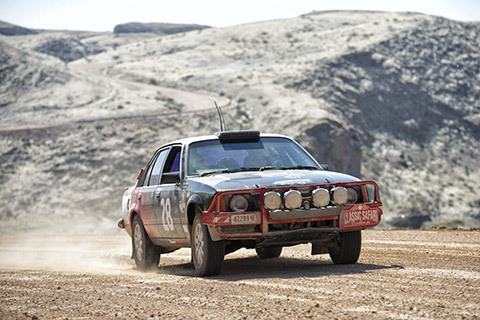 The Lancia was 5th and the 1800, now suffering gearbox problems, settled for 6th. Gold medals were won by the Sunbeam Tiger crew, Alan and Tina Beardshaw.